In a teardown done with production hardware, research firm iSuppli now says a base iPhone 3G costs just $174.33 in pure manufacturing costs, or less than what it took to build the less capable original. The conclusion is almost exactly identical to pre-release estimates and gives Apple a $53 savings over the original despite the inclusion of chipsets for 3G data and GPS. And while the bill of materials doesn't include the price of shipping the phone, selling it, or creating the software that runs it, the inexpensive design is said by iSuppli to be a deliberate move by Apple to fulfill its short-term goal of establishing as much marketshare as it can early on into iPhone's history. "iSuppli believes Apple aimed for a more cost-effective design for the 3G iPhone compared to the 2G, in order to lower the retail price," says principal analyst Andrew Rassweller, "which will allow the company to seed adoption and to capture maximum market share nowwhile the company still has buzz and a perceived differentiation relative to its competitors." In addition to keeping many of the same parts, including the Samsung processor, Apple saves money by redesigning the internal layout. Rather than two tightly connected circuit boards, iPhone 3G uses a single but more durable board. The battery is also no longer soldered to the device, making it easier for technicians to replace the battery. 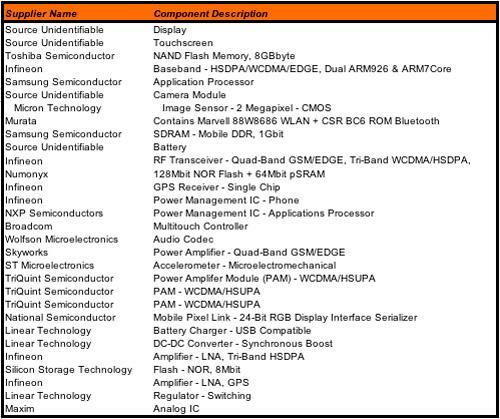 The estimated bill of materials for iPhone 3G..
Where Apple has changed parts is also consciously done to expand the compatibility of the phone with non-US networks as much as possible, iSuppli adds: the particular Infineon chipset supports WCDMA phone networks (used in Japan and Korea) and therefore works in areas where the first iPhone would be incompatible. With roughly $50 in licenses for patents and other intellectual property factored into the price and an assumed unsubsidized cost of $499 for an 8GB model of the celllphone, Apple is thought to be getting as much as $300 in subsidies from AT&T for each customer who buys at the much-publicized $199 price, or enough for a substantial 55 percent profit margin before accounting for marketing and software.